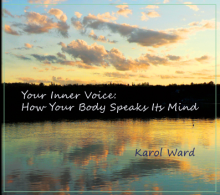 Your Inner Voice: How Your Body Speaks Its Mind is a series of meditations that show you how to build your confidence through the wisdom of the body-mind connection. Each audio track, is set to original music and can be used to problem solve, relieve stress and help you trust you. The meditations on Your Inner Voice have been specifically designed to help you understand and trust, the quiet confident voice inside that knows what to do.